Roma. Part of Italy showing the Roman Territory and the neighbouring country. 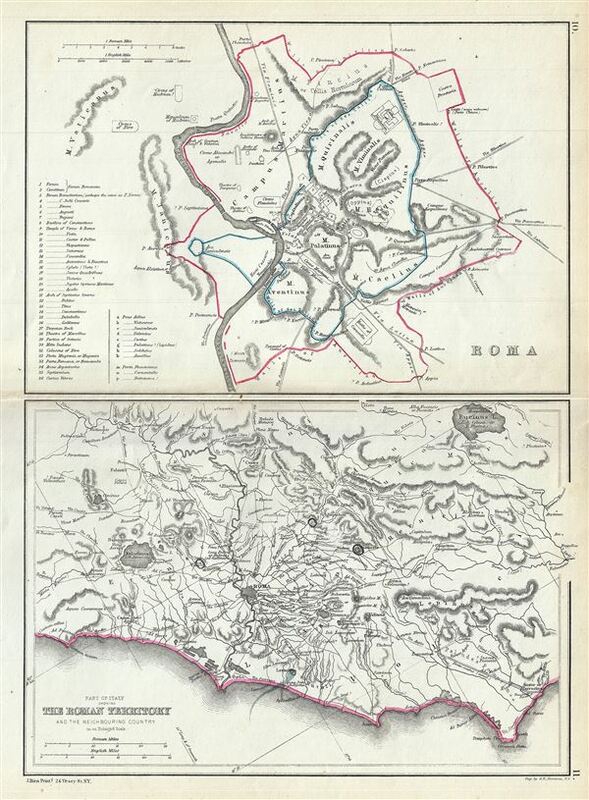 This is a beautiful 1867 map by William Hughes depicting Rome and the Roman territory in Italy during ancient Roman times. Essentially two maps on a single sheet, the map on top depicts Rome during ancient Roman period. The Wall of Aurelian and the Wall of Servius Tullius (the Servian Wall) are both identified and color coded. The map depicts the city in extraordinary detail labeling important ancient roads and buildings of the time. These include the baths of Caracalla, Circus Maximus, the baths of Diodetian, the theater of Balbus, the Colosseum, and others. A key identifying 47 ancient sites is included in the lower left quadrant. The map on the bottom depicts the Roman territory in the vicinity of Rome. This particular map includes ancient and contemporary names for the important regions and sites around Rome. It also notes rivers, canals, roads and other topographic features. This map was created by William Hughes, printed by J. Bien and engraved by G.E. Sherman, for issued as plates 10 and 11 in Sheldon and Company's An Atlas of Classical Geography. Very good. Minor wear and toning along original centerfold. Minor manuscript ink markings on lower map.